It's Supernatural meets the mafia. It is. You don't need me to say anymore. THAT ALONE SHOULD SELL YOU. Crime...ohhhh my gosh I love crime. (Yes that sounds bad. But I love crime in books. We good? Okay. We're good.) It's like a family business, being a worker. You get born a curseworker though, so Cassel, who is the youngest of a COMPLETE worker family is a non-worker and that's...kind of hard for him. His big brothers are deep into the family work for crime bosses. They work for Zackeroff. (Hey, I listened to it on audio, so nooooo clue how any of the spellings go. Just bear with me.) Cons. Crimes. Murder. Blood money. LIKE WHY HASN'T EVERYONE READ THIS YET???? There are definitely cats in this book. I hate cats. But I survived. At first I thought the cats in the beginning were kind of weird. BUT OMG IT ALL MAKES SENSE NOW. Family. That's all I can say. FAMILY. I love books about family and warped families win the cherry cheesecake for sure. With Cassel's brothers so criminal and his mother in jail and yet Cassel still put them first?! Also Cassel spends a lot of time with his Grandfather, who's a death-worker. I loved that too. The grandpa cared and loved Cassel, but didn't absolutely smother him. I LOVE THE ENDING THOUGH. Family means so so much...but what do you do when your family does things you can't...you can't....just no. The crime side? It wasn't as prominent as I hoped, but Cassel ran a lot of cons, first at his school, and then a MASSIVELY clever one at the end. He's a seriously good con-man. Another reason to love him, yup. There are actually a few friends too! Not a lot, because Cassel doesn't do friends (he has a Big Bad Secret hanging over his life). But I loved Sam and Danika. They were perfection, just in the story enough to make it pop with brilliance but yet not having to be Cassel's #1 concern. CAN WE JUST TALK ABOUT THE INSANELY GOOD PLOT TWISTS?!! Nearly everything had me screeching. I predicted a few of the twists just by thinking what I'd do (as a writer) if this was my story. And hold those holy potatoes again, but I so would die happy if I ever wrote even a quarter as well as this. This is insanely awesome. Everything was perfectly explained and Holly Black brought us into this world with no excessive info-dumping and no utter confusion. I love it I love it I love it. - oh my GOSH. I cannot believe much I grinned like an evil monkey when I realised Cassel was the transformationist. I knew it'd be someone unexpected, but I thought it was one of his brothers. CASSEL, THOUGH?!! Best. twist. ever. I just couldn't get over how his brothers basically used Cassel as their murder weapon. He thinks he's the kid who's stuffed under the floorboards and no one cares about him because he's "Not a worker" but in reality he's their #1 asset. HOLY FREAKING POTATOES. I LOVE THIS BOOK SO MUCH. - That chair Cassel hates on? Well, I reckon it's a person or something. I actually wonder if their entire grubby cluttered house is partially filled with objects that used to be human. Don't you reckon?? - And now I totally don't think Cassel's dad died in a car accident. Did Cassel kill him?? Omg. I need book 2. - Lila is an AMAZING character. She is just...woah. She is a bully and she's exceptionally well written. I hate her and love her at the same time. - I have no idea where book 2 is going. But I'm going to love it. GO READ THIS. I can't...I don't even have anything more to say. YOU MUST READ IT AND FLAIL WITH ME. It goes on my shelf of Favouritest-Books-Ever. Perfection, pure perfection. 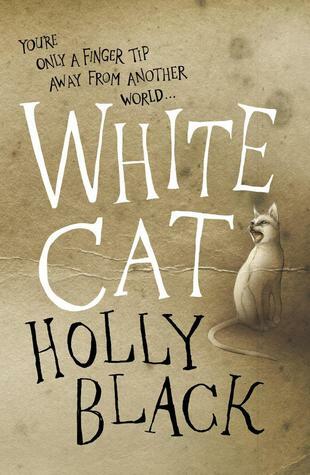 Sign into Goodreads to see if any of your friends have read White Cat. 30.0% "I seriously like this book. CONS, PEOPLES, CONS. It's like heists and cons with magic. *hugs book and all villainy*"
70.0% "This is like Supernatural meets the Mafia. I love it." GAH I'M SO HAPPY THAT YOU DISCOVERED IT. THE SECOND BOOK IS ALSO GREAT! @Kezia: I JUST FINISHED THE SECOND BOOK AND JAFSKLDFAS NEW FAVOURITE SERIES. @Kimberly: OMG YOU NEED TO READ THIS. NO REGRETS. HONEST. GO FOR IT. IT IS AMAZING. I finished the second book!! I LOVED IT SO MUCH TOO. (Though I actually preferred White Cat by like....a teeny tiny bit. XD) I seriously need the third though. omg. PANIC STATIONS. This book is just so so good. I agree with you on everything, including the spoiler section!! I already ordered the second one! Violence in books is so pure and beautiful and I just live for Lila cause she is so mean but not in a mean way and I can't even.